Okay, mi gente. It is that time of year again! Time for MommyMaestra's annual Hispanic Heritage History Quiz! How many of you are Latin history buffs? The last two years, I've given away a set of BrainQuest's Hispanic America. So it's sort of una tradición around here. 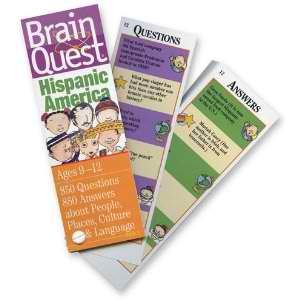 And once again, one MommyMaestra reader will win a set of BrainQuest's Hispanic America trivia cards. To enter, all you have to do is correctly answer 6 of the 12 (yes, I went up!) Brain Quest questions listed at the end of this post. I tried to pick ones that were a mix of easy and hard...(Mwuah-ha-ha!) AND ones that weren't part of last year's giveaway (Chihuahua, it's getting harder to do that!). • For an additional entry, follow MommyMaestra on Facebook. Be sure to leave a separate comment letting me know that you did! • Like last year, anyone able to answer all 12 questions earns the title "Supreme Trivia Master." The deadline to enter is September 30th, at 11:59 pm EST. The winner will be chosen using Random.org and be notified via email. (Please be sure to provide a valid email address with your entry or some other way to contact you or your entry will be invalid.) The winner must have a valid United States mailing address. 1) Where would a Latina be at home wearing a pollera and dancing the tamborito? 3) What is the oldest surviving European city in all the Americas? 4) Which country's capital city is Managua? 5) Which is the Spanish word for "infinity:" infinidad or infinito? 6) The word sierra can be found on maps of Mexico and the U.S. What does it mean? 8) Which South American river is the world's second longest river? 9) What does the title of the song "Guantanamera" mean? 10) What Latin pop singer had her first English-language album, Laundry Service, go triple platinum? 11) What Arizona-born Hispanic singer's first big American hit was "You're No Good" in 1974? 12) What Spanish American actor played the President of the United States on TV's The West Wing? Bonus: During America’s war for independence from England, which side did Bernardo de Gálvez fight for?